“Screens, screens, screens" was the motto of the demo slots as it was for the entire symposium. During all coffee breaks you had the opportunity to experience the latest R&D results of the FOKUS competence centre Future Applications and Media (FAME). 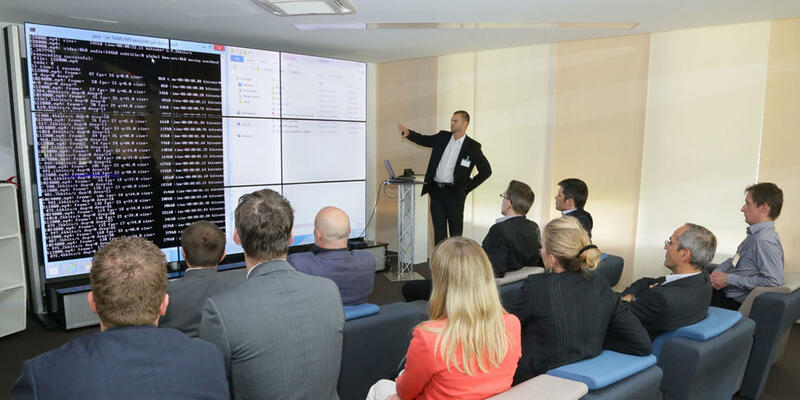 We offered 30 minutes tours to our Future Applications and Media Lab and TV Lab where you can see how we develop and test new software components in concert with state-of-the-art client and server infrastructure. Imagine your TV informs you about available additional content to the TV program you are just watching. Imagine the notification is sent to your mobile or tablet automatically and you can access the content just by clicking on the notification. This is possible using HbbTV on TV and FAMIUM.browser on your mobile device conforming W3C standard: Webscreen. The connection and synchronisation of both devices is done automatically via Network Service Discovery using UPnP. We demonstrates this scenario in a showcase that contains additional information for an advertisement that is shown in a commercial break during a HbbTV program on a second screen device. In addition to that we will demonstrate adaptive streaming (DASH) based dynamic ad-insertion to splice ad videos into the actual play-out stream directly. Dynamic Adaptive Streaming over HTTP (MPEG-DASH) is the upcoming streaming standard for the Web and will harmonize Internet based video delivery among various end systems. Our FAMIUM.wall solution uses DASH to stream one videos to many clients keeping the playback completely synchronized between all screens. We demonstrate to stream a 4k video - split in four or nine HD videos - playing synchronously across the screens. Commercial solutions for playing protected content in a browser require a plug-in. We demonstrates a solution which is based on the upcoming W3C standards Media Source Extensions (MSE) and Encrypted Media Extensions (EME). 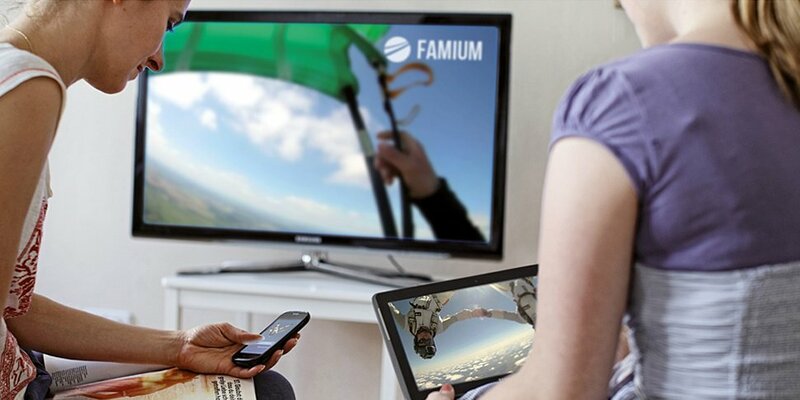 The FAMIUM.browser which supports these standards is able to stream Microsoft PlayReady DRM-protected videos. 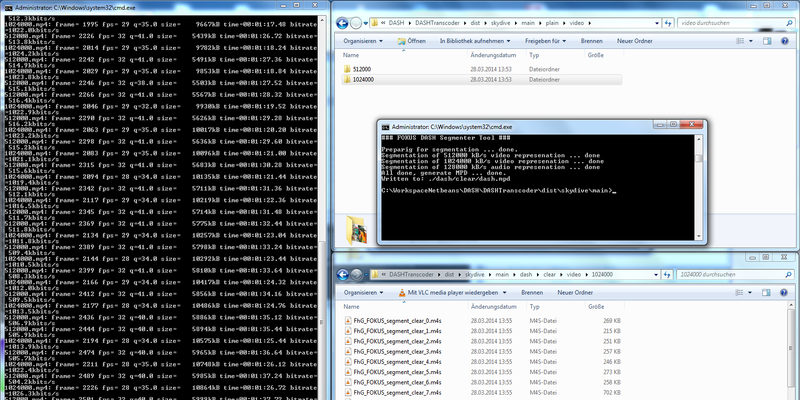 The demonstration also visualises the process of key exchange and decryption between browser, CDM and CDMI. The CDMI is an open interface for accessing a platform DRM Content Decryption Module (CDM) and is not specific to PlayReady, Microsoft’s DRM. It can be used by a User-agent to expose CDM functionality as specified by the W3C HTML Encrypted Media Extensions without licensing DRM technology. During this demonstration we introduce our tool chain for DASH and DRM media creation and streaming. The demonstration features video capturing followed by DASH conversion / segmentation and protection by PlayReady Microsoft DRM. You will see how to operate our tools to create PlayReady protected DASH content to be streamed be am HTTP-Server to be consumed be State-of-the-art mobile and fixed devices. Raspberry Pis are low-budget devices that leverage hardware capabilities for encoding and decoding. 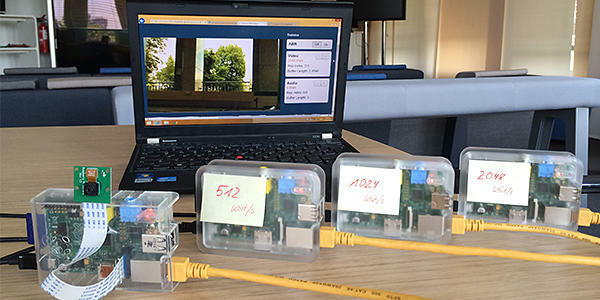 Based on our tool chain for DASH and DRM content creation, we created specific extended builds that can be run on Raspberry Pis to generate live and on-demand content. We showcase live transcoding and segmentation of a plugged camera. The generated DASH output will be multi-bitrate audio and video. The whole architecture consists of mutliple Pis that are interconnected and jointly create mutliple bitrate representations of the input signal. This demo will introduce our recommendation engine, algorithms and framework to you. 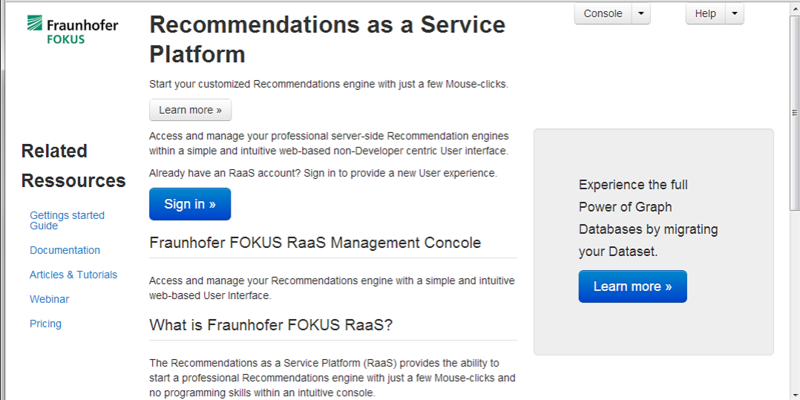 RaaS is using those components offering a comfortable interface enabling software developers to create manage and deploy custom made recommendation engine designed for certain tasks and objectives. You will see how to create a Recommendation Engine and how to apply it to a certain application domain.